That is an amazing statement to have been made by someone who works at a job that pays $400,000 a year and somehow he and his wife made $5.5 million in the first year of his presidency. These facts are noted in an editorial piece posted at Investors.com yesterday. “If the president is eager to regulate salaries, he might begin — and end — with the federal work force. Commerce Department data show that average federal worker compensation of $119,982 in 2008 was twice that of average private-sector pay ($59,909). When did we elect a President to tell us how much any of us should earn? What does the President see as his ‘enough’ amount? Hot Air reported yesterday that the United Nations has elected Iran to its Commission on the Status of Women. Right. According to its website, the Commission on the Status of Women is “dedicated exclusively to gender equality and advancement of women,” The article also points out that the United Nations Commission on Human Rights includes such freedom-loving nations as China and Saudi Arabia. I really wonder if both the United Nations and the United States have forgotten the call and the responsibilities of freedom. In 1975 on April 29, the United States began a helicopter evacuation of U. S. Citizens, South Vietnamese allies, and others out of Saigon. On April 30, the city surrendered, and more than three million people died in the political chaos that followed. Unfortunately, America caused the deaths of these people. A new book, AN AMERICAN AMNESIA, written by Bruce Herschensohn, details the sequence of events that caused the massacre that followed. The book is reviewed at DisruptThe Narrative at Word Press. What the book tells us about our government and the media during the 1970’s is frightening and sobering in view of current events. Prince Matak was shot in the stomach when the Khmer Rouge seized Phnom Penh. He was left unattended and took three days to die. During the Khmer Rouge’s reign of terror that followed, 15 million people died from execution, starvation and forced labor. “Chris Dodd: The greatest gift our country can give to the Cambodian people is not guns, but peace, and the best way to accomplish that goal is by ending military aid now. History will repeat itself if we turn our backs on either Iraq or Afghanistan. Unfortunately, we are the only nation in the world that would even consider preventing the slaughter of innocents that would follow an American abandoment of either country. We can behave honorably or we can be responsible for another slaughter as we were in 1975. “It also requires local police officers to question people about their immigration status if there is reason to suspect they are illegal immigrants; allows lawsuits against government agencies that hinder enforcement of immigration laws; and makes it illegal to hire illegal immigrants for day labor or knowingly transport them. This is ridiculous. Why shouldn’t Arizona be unfriendly to undocumented (illegal) aliens? What part of illegal does Professor Spiro not understand? Is illegal only illegal if he says so? Carry proof of your permanent resident status at all times. older, you must carry proof of your immigration status. Forms Line. There is a fee to file Form I-90. I think we need to enforce our own laws. This is a picture from yesterday’s Investors.com website. The picture was included in an article about Congress shutting off the water to the Central Valley in California. The consequences of this man-made drought are unemployment rates of as much as 45 percent, an increase in mortgage foreclosures, California having to import vegetables rather than growing them locally, and increased food prices for the rest of us. This is not regular ‘hardball politics.’ This kind of political move hurts everyone. I understand the Congressmen caving into that kind of pressure, but we need people in Congress who will stand up to the bullying that is going on from Washington. Until we put men of integrity in office who will stand up for what is right, this kind of nonsense will continue. Yesterday Investors.com posted an article about the timing of the release of the report by the Medicare’s Office of the Actuary which showed that the healthcare reform act would significantly increase the cost of healthcare. case if the legislation hadn’t become law. The Senate leadership needed to have healthcare reform passed to provide a victory for President Obama; they chose not be bothered by the facts in studying the bill (that’s assuming they studied the bill). It is unfortunate that our “representatives” in Washington are more interested in gaining political victories than they are in representing the American people. We need to vote all of them out in November. George Will posted an editorial today at the Washington Post commenting on Arizona’s new Immigration law. Mr. Will points out that being in the country illegally is already a federal offense–Arizona simply made it also a state offense. that the person is here illegally. The implication here is that the person in question has been detained by a policeman for a legitimate reason and that as part of the investigation process of the individual, his status as an American citizen will be confirmed. I would have thought that would have been understood already. After learning some of the problems caused in Arizona due to illegal immigration, I applaud their efforts to enforce the law that being in the country illegally is a crime. The principle job of a government is to protect its citizens. Arizona is in danger of becoming the kidnapping capital of the world due to the illegals entering the state. We need to remember that included in the illegals entering the state are drug smugglers and people who have no interest at all in contributing to the growth and well-being of America. That being said, I would like to see our immigration process streamlined so that people who want to come here and work do not have to wait years to have their applications approved. The way things stand right now, we are allowing a group of people to ignore our laws while taking advantage of our medical and social programs. This is not a good situation. country without authorization can be imprisoned for up to 10 years. It’s time for some basic reciprocity. Green energy will be coming to Massachusetts. According to Breitbart.com today, Interior Secretary Ken Salazar will approve the nation’s first offshore wind farm to be built in the Nantucket Sound off Cape Cod. The wind farm will have 130 turbines. Theoretically this is a great idea. The question becomes how it will work in actual practice. Two Wampanoag Indian tribes protested the construction of the wind farm because one of their sacred rituals requires an unblocked view of the sunrise over Nantucket Sound. The article also stated that the wind farm would be built on long-submerged tribal burial grounds. Meanwhile, the Boston Herald reported today that Paul Kirk (the man who was the replacement Senator for Ted Kennedy for a short time) stated that Senator Kennedy would be saddened by the approval of the wind farm. Regardless of how you feel about this project, it will tell us a lot of things about the feasibility of future wind power. New England (and its coast) have a lot of wind. If wind power can be an alternative to our current energy sources, New England is where it will be successful. Putting up the Cape Cod wind farm is similar to the Wright Brothers testing their airplane at Kitty Hawk, North Carolina. Kitty Hawk is always windy–if the airplane was going to fly at all, it would fly there! If wind power is going to work at all, it will work off Cape Cod! Front Page Magazine posted an article about a Solidarity with Israel Rally that took place in front of the Israeli Consulate in New York City on Sunday afternoon. The rallying cry of the day was “Obama – Stop Pressuring Israel”. There were more than 2000 people in attendance. Please follow the above link to the article. Fern Sidman, who wrote the article, explains a lot of the contradictions between Jewish groups who are supporting President Obama and don’t want to lose their influence with his administration and those Jewish groups who see the danger to Israel in making too many concessions in the name of peace. We are in danger of taking the side of countries that want to see Israel destroyed–there has been no evidence since the Palestinians have been given the Gaza strip that they want to spend money on infrastructure or on helping their people. Any money they have received has gone toward weapons aimed at Israel. Until that changes and they begin to build a viable state, I see no reason why we should force Israel to make concessions to them. Israel and America are not the only countries in the crosshairs of the radical element of Islam. The War on Terrorism should be a worldwide effort, and Mr. Dosapati realizes that. Hopefully the rest of the world will realize it before it is too late. The UK Sun is reporting today that Noah’s Ark has been found in Turkey. Now please understand, I don’t have a problem with the story of Noah’s Ark, I just have a problem with it being found in Turkey. It may actually be there, but I remain skeptical. Anyway. The remains of Noah’s Ark are reported to have been found by a group of Chinese and Turkish evangelical explorers 13,000 feet up on Mount Ararat. They claim that carbon dating places the wreckage at about 4,800 years old–about the time the ark was supposed to exist. The Turkist government is applying for Ankara to apply for UNESCO World Heritage status in order to protect the site while a major archaeological dig will be undertaken to determine exactly what the site is. As I said, I have no problem believing the story of Noah’s Ark–I figure God can do pretty much anything he chooses to do–I just really have a hard time believing the wooden structure that was the ark survived almost 5,000 years. Stay tuned. There are more ways to take over a country than guns. We need to make sure as a nation that when we are tolerant of other cultures in our midst that those cultures respect America and its culture. When I saw Senator Ben Nelson of Nebraska vote against the financial reform bill yesterday, I assumed that it was because he is in political trouble in his state after reversing his vote on healthcare reform. I was wrong. “On the financial bill, at the request of Warren Buffett’s Berkshire Hathaway, Nelson had added a provision to the financial reform bill that would exempt existing derivatives contracts from new collateral requirements. The provision would have saved Berkshire Hathaway the trouble of setting aside $8 billion in collateral. The provision that the Democrats killed will cost Berkshire Hathaway up to $8 billion in money they will have to set aside to meet the requirements of the new reform. The company holds $63 billion in derivatives contracts with very little collateral. Holding that much of any financial product without collateral is risky, but frankly I would be more inclined to trust Warren Buffet with my money than the government. On March 20th, Representative Andre Carson claimed that when he left the Canon office building, he was greated by health care protestors shouting the “N word”. He stated that the scene was so hostile, he expected rocks to follow. Andrew Breitbart offered $100,000 for proof of the racial slurs. Yesterday Big Government posted an article detailing the results of offering that $100,000. Andrew Breitbart still has his money. “But how does that “win” manifest itself? On April 15, the day of the Tax Day Tea Party in front of the White House, and being interviewed by ABC’s Terry Moran for Nightline set to air Tuesday night, I passionately defended the movement against the powerful racism charge that has been greatly pushed by the Congressional Black Caucus’s accusation of a 1960 Selma-like incident near the Capitol. “At least twice during the spirited questioning by Moran, bystanders screamed “racist” at me. It’s time for the media to stop calling people names and be willing to talk about the solutions to the economic and terrorist threats this country faces. I am not a scientist, so if anyone reading this has scientific information, please comment. I truly do not know what to make of this story. 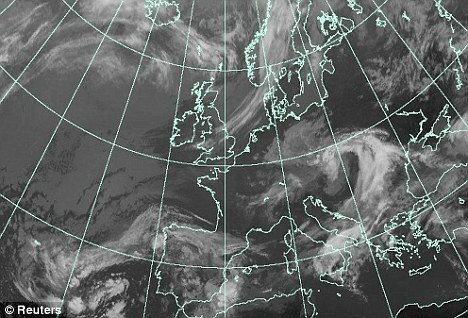 This is a satellite picture that was posted at the UK Daily Mail website today included in a article stating that the volcanie ash cloud over Britain after the eruption of the Iceland volcano was non-existent. “Jim McKenna, the Civil Aviation Authority’s head of airworthiness, strategy and policy, admitted: ‘It’s obvious that at the start of this crisis there was a lack of definitive data. Byron York posted an article at the Washington Examiner yesterday about the Democrats in Congress deciding to go forward with an Immigration Reform Bill rather than a Cap and Trade Bill. I suspect this move will result in neither bill passing Congress. The failure to pass these two bills may be the only hope the Democrats have of maintaining control of Congress after the November elections. Lindsey Graham had crafted an energy bill with John Kerry and Joe Lieberman. The bill was supposed to be unvieled today. But things changed. After the unveiling of the Arizona legislation, the Democrats felt they could use the ‘crisis’ (remember “never let a crisis go to waste”) for political advantage and pass immigration reform. That would be an amazing reach–the last effort at immigration reform (2006 and 2007) took many hours of bi-partisan work and eventually failed. To put together a workable immigration bill before the November elections (the theory is that new Hispanic citizens will vote Democrat) and pass it (assuming someone will have time to read it) would be an amazing feat. Also, keep in mind that with so many Congressional incumbents being seriously challenged in the November election, Congress is going to want to get out of Washington and seriously campaign before too long. The American people have said for a number of years that the first priority of an immigration bill should be to secure the boarders. Until we do that, anything else is meaningless. Serial amnesty is not a workable policy for the longterm security of our country. I support what Arizona is doing and definitely understand their reasons for taking action to reduce the number of crimes being committed in that state by illegal aliens. No, this isn’t an article about some dangerous right-wing extremist or even some dangerous left-wing extremist–it’s about giving Congress the information they are looking for regarding the shooting at Fort Hood. Today’s Washington Post posted an editorial about the difficulties the Senate Homeland Security and Governmental Affairs Committee has had getting access to documents and witnesses in the Fort Hood shooting investigation. The Washington Post points out that the Congressional investigation could easily proceed without interfering with the criminal charges. The goal of the Congressional investigation is different from the goal of the criminal investigation. The Congressional investigation is looking into the incident in order to find ways of preventing future incidents–they are not involved in criminal prosecution. I have only one idea on how to prevent future incidents–common sense. The information that has come out about Major Hasan since the shooting shows a number of incidents that should have set off alarms. Evidently, those alarms were ignored our of fear of being labeled anti-Muslim. He is entitled to his belief that infidels are condemned to hell. The problem is that he made it clear that he put no value on their lives. The shooting at Fort Hood had nothing to do with a lack of laws–it had to do with an unwillingness on the part of the military to see what was right in front of them. I missed this when it was posted. I’m posting it now because I think it is extremely important. This article is based on two sources, a Wall Street Journal article on April 14th and a Big Government article by John Loudon. According to the Wall Street Journal, a federal rule went into effect April 13th that would “require “project labor agreements” for all construction projects larger than $25 million. This means that only contractors that agree to union representation are eligible for work financed by the U.S. taxpayer.” This is the result of an executive order signed by President Obama early in his presidency. There are a few problems with this law. Only 15% of construction workers are unionized. To demand that all government construction work be unionized seriously hampers the competitive bidding process–non-union contractors cannot submit bids. Paying attention to politics at all levels has always been a good idea, but I don’t think it has ever been as necessary as it is now. If Americans do not begin to vote against the kind of favoritism that this administration is showing toward unions (violating backruptcy law in government takeovers, limiting the bidding process on construction projects, etc. ), we are going to find ourselves living in a country where freedom is a distant memory. Why I Bought A Ford ! Ed Morrissey at Hot Air reported Friday on the announcement that GM had paid off its government loans. Well, things are not always what they appear to be. I am not a financial analyst, and I don’t claim to understand everything I am about to relate, but I will do my best. “During an April 20 hearing on Capital Hill, Sen. Tom Carper, (D-Del.) asked some pointed questions of Neil Barofsky, the “special watch dog” on the Wall Street Bailout, aka, TARP. Wow. Does that mean if I pay my VISA with my MasterCard, I can consider myself out of debt? This is my kind of accounting! 3) The date that you anticipate that the remaining funds in escrow will be released to GM. I, for one, would like to read the answer to that letter. This a picture of some of our soldiers in Afghanistan. The picture is part of an article by Michael Yon about the battle for Kandahar. The article can be found at MichaelYon-online.com. It is a rather long article, but I strongly suggest reading it. Michael gives some insight into the history of the war in Afghanistan and what is involved in fighting it. Please pray for our servicemen and women. Howie Carr posted an article at the Boston Herald today about the fact that property taxes in Massachusetts are about to go up. Property taxes are supposed to be limited by Proposition 2 1/2. Proposition 2 1/2 was approved by Massachusetts voters in 1980 and put into effect in fiscal year 1982. The Proposition limits the amount of money a city or town may raise from property taxes each year to fund municipal operations. Well, the Massachusetts state legislature is working on finding a way to get around Proposition 2 1/2. “This time, as you know, the hacks want to sock it to homeowners, allowing the taxaholic towns to raise property taxes beyond the 2.5 percent limit imposed by Proposition 2 ½.
Mr. Carr points out that the plan to raise property taxes is being kept rather quiet until after the filing deadline for candidates in the November election. This year Massachusetts has many Republicans running for state and national office, and hopefully we can someday become a two-party state. Meanwhile we need to vote out of office anyone who votes for this game to override Proposition 2 1/2. Bloomberg.com reported yesterday that President Obama has called for an overhaul of America’s immigration laws. The President stated that a failure to do so would result in more ‘misguided’ attempts by the states (such as Arizona) to fix those laws. Just for the record, I don’t believe this is by accident. I think the Obama Administration has been looking for an excuse to go after immigration reform, and Arizona provided it. Well, hold on a minute. It seems as if Arizona has a much better picture of the immigration issues than Washington, D. C., would have. Arizona has been dealing with major crime problems caused by Washington’s lack of enforcement of immigration laws for years. Last month according to Fox News, a rancher was killed (allegedly by illegal aliens) while working on his ranch. Last year according to the Washington Times, a rancher was sued by illegals for turning them over to the Border Patrol. When I grew up, that was called good citizenship. I am not opposed to legal immigration. I agree that the legal immigration system needs to be streamlined and reformed. I do, however, object to the idea of instantly making illegal aliens citizens. We have people who have been on waiting lists for years wanting to come to this country. It seems to me that they should be at the head of the line–not the illegals. My concern with Congress putting together an immigration bill is that it will be used as the basis for registering millions of new Democrats in time for the November elections. I simply do not trust the current Congress to act in the best interests of the country they are supposed to represent. I am also concerned that because there are only seven months until the election, something will be rushed through without anyone knowing what is actually in it (sound familiar?). It’s time to step back and see what the impact of the new law in Arizona will be. We can watch that for a year or so and then proceed. According to the Associate Press yesterday, posted at the Washington Examiner, the Supreme Court has refused to hear a request for overturning the ban on federal funding to ACORN. Aside from the money-saving aspect of this, I think ACORN should be denied funding. The federal government has been extremely lax in its oversight of the money it gives out to all organizations, and it is time to reevaluate all of this kind of spending. If money given to an organization results in a positive impact on the community, that is one thing. If money given to an organization results in highly paid staff accomplishing very little, that needs to stop. Employer coverage will decrease–it will be cheaper for employers to pay fines than to insure employees–forcing people to enroll in Medicaid. This will overburden Medicaid. Seniors will lose Medicare Advantage coverage. Businesses will be faced with hugh penalties because they will not be able to afford the policies the government requires. The increased costs to businesses will be passed on to the consumer in the form of higher prices for drugs, medical devices, and premiums. The “CLASS Act” long-term-care insurance is probably unsustainable. National health spending will increase by $311 billion over the next ten years, increasing federal spending rather than decreasing it. In 2019, there will still be approximately 23 million people uninsured–5 million illegal aliens and 18 million who pay the fine instead of the cost of insurance. Spending reductions “may not be fully achievable”. Sounds like a normal government program. There will be fewer places that senior citizens will be able to go for treatment. Access to care for senior citizens will quickly become an issue. The increased demands on Medicaid will make it difficut to find care. I got a letter from my Congressional Representative yesterday explaining how great the healthcare reform bill was. I wrote him back that I would be actively campaigning for his opponent in November. Please join me–if your Congressman (or Congresswoman) voted for the healthcare reform bill, please donate or campaign for their opponent in November. We need to repeal this awful bill before it has time to do any serious damage to our country. Investors.com posted an article yesterday by Michael Barone on what is happening in the financial sector of our economy under the Obama Administration. He reminds us of the Chrysler bailout where bankruptcy law was violated and bondholders forced to accept 33 cents on the dollar on secured debts while United Auto Worker retirees were given 50 cents on the dollar on unsecured debts. Unfortunately, the saga continues. Last Friday, the Securities and Exchange Commission filed a complaint against Goldman Sachs charging it violated the law in the sale of one of its financial products. There are a few fishy things in this charge. Fishy thing number one–the charges have to do with the fact that the company did not disclose that the product was put together by John Paulson–at that point, he was not well known, and disclosing his involvement would not have mattered. Fishy thing number two–the Securities and Exchange Commission usually moves on a complaint only when they have a unanimous vote–in this case the vote was not unanimous and strictly along party lines. Fishy thing number three–Democrats immediately cited the complaint as a reason to pass Chris Dodd’s financial reform package. The problem with the bill is that it encourages political favoritism. We have that to some degree already–we don’t need to institutionalize it.